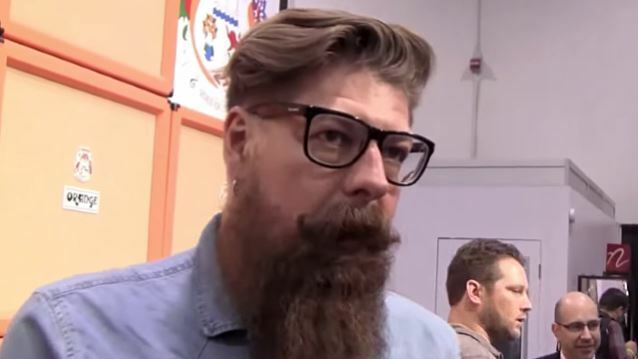 Guitarist Jim Root says that he has "no desire" to rejoin STONE SOUR, claiming that some of his former bandmates just want to write "poppy rock" songs for the radio. Root and SLIPKNOT singer Corey Taylor much of the last four years recording and touring behind three full STONE SOUR studio records, including 2010's "Audio Secrecy" and the double concept album "House Of Gold & Bones". Root was dismissed from STONE SOUR at the end of last year — even as he and Taylor were working together on a new SLIPKNOT album. Root told Guitar World magazine about the differences that led to the split: "Some of the guys in STONE SOUR, I think they just want to be a radio band and write strictly for radio and try to be more of a poppy rock band. And that's not really what I'm into. There's at least one guy in the band that's only concemed about money. I really have no desire to associate with people like that anymore." Jim recently told Revolver magazine that a disagreement about STONE SOUR's touring activities precipitated his exit from the group. "It became apparent to me near the end of the album cycle for 'House Of Gold & Bones' that it had basically run its course," he said. "But the band kept pushing for more dates, and I was just, like, 'It's time to stop!'" He continued, "SLIPKNOT made it possible for STONE SOUR to have everything that it has and there were people in SLIPKNOT that have been sitting idly waiting to do a new album. And I had fans asking me every day, 'When are you doing SLIPKNOT?'" Root said that he was fired from STONE SOUR in November 2013, revealing, "I was mad because STONE SOUR wanted to go do a tour and they didn't want me to be a part of it. So I had a little anger, and I had a little bit of depression. I was kind of hurt. But at the same time, it was probably all for the better, because I wasn't really happy in that band anymore." Taylor addressed the issue as well, saying, "It was difficult, at first. It put a strain between he and I for a little bit. It was one of those things where the timing just sucked. But at the same time, we knew that, on both sides, we’ve gotta do what we’ve gotta do." Taylor added that working together on the new SLIPKNOT album actually helped mend fences between him and Root, explaining, "We were able to kind of channel that and put it into what we were making, which I think in a lot of ways helped the overall aggression and emotion really get there."